Miss Sloane comes from first time screenwriter Jonathan Perera and promotes the idea that to get ahead in the vicious game of D.C. lobbying one has to know their subject. Perera obviously knows his subject. How Perera, who was living in Asia at the time he wrote the screenplay and who only optioned his work to literary agents over the internet before securing a production deal knows so much about the inside dealings of those hired to persuade legislators to support particular businesses or causes is a mystery, but he seems to have done a fair amount of research. Either that or what he feeds us in Miss Sloane is a huge pile of eloquently written BS. Like an Aaron Sorkin script (I haven't seen The Newsroom, but I imagine this might feel very similar) where dialogue is almost more important than emotion Miss Sloane fast tracks the audience through a deluge of day to day activities that a lobbyist at the top of their game such as the titular Sloane played with vicious velocity by the one and only Jessica Chastain might engage in. We are given little time to keep up and even less to really gauge what Sloane and her team are working on as the focus is not meant to highlight what kind of case our titular lobbyist and her team are working on, but more how keenly they are framing it to their client's advantage. While the objective for a lobbyist is the end-game it is the getting there, the journey if you will, that requires the creativity of someone in Sloane's position and the more creative one is the better the reputation they garner in their professional circles despite undoubtedly garnering a worse one among friends. Of course, this is why it is also made clear Sloane has no family or friends to speak of or to. It is a vicious circle of sorts and Perera makes that evident by reiterating the importance of how information is framed by framing his own film with that aforementioned end-game. In Miss Sloane the end-game is a hearing on Capitol Hill in Caucus Room 4 of the U.S. Senate. What is she doing here? What has brought her to this point? What accusation is being thrown around and what does it have to do with her abilities and/or the moral ambiguities of her techniques? Each are questions begged as small increments of information are fed the viewer within the epilogue of the film, but once the main narrative takes over it is easy to forget that framing device and simply go along for the ride which is exactly what Perera would prefer you do as he finds trouble in both sticking the ending and making it credible enough that we don't question how well he really does know his subject. Elizabeth Sloane (Jessica Chastain) and certain members of her lobbying team leave their current office to join the opposing side. Miss Sloane is a perfect example of a movie that weighs itself by the quality of the average movie surrounding it. There is nothing overly exceptional about any one facet of the film, despite every aspect of it being accomplished in a precise and professional fashion. 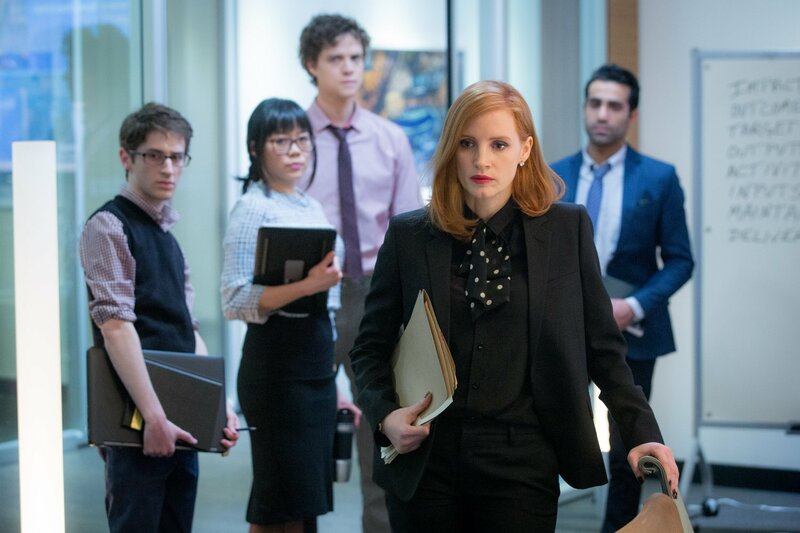 Professional may actually be the best word to describe Miss Sloane as everything from the aesthetic of the shiny white board rooms that make up a majority of the environment here to Chastain's sharp as a razor hairstyle are in line with what one would expect from a film about D.C. lobbyists. 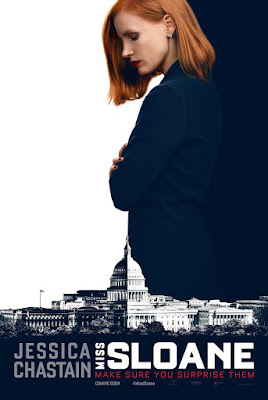 That may sound as if Miss Sloane packs nothing in the way of surprise and that would be false considering Chastain spews a monologue in the opening frame of the film about how lobbying is about foresight and how it is necessary to anticipate your opponents moves and to make sure they don't anticipate yours-an idea Sloane takes to her grave-but as far as the filmmaking aspects are concerned: the look, the feel, the music, the color palette-they are all in line with pieces of entertainment we have seen spawned from this world before. And so, it is left to both the screenplay and the performances to elevate the conventional mechanics of the presentation and elevate they do. Not only do we have Chastain leading the charge here in what may be one of her most impressive performances to date (and that's sincerely saying something given her body of work over the past few years), but Alison Pill manages the fine line of portraying someone intended to be invisible while making her presence known among a roster of all-stars. Among those well-groomed in the art of spouting lengthy speeches compellingly is Michael Stuhlbarg as Sloane's boss turned opponent when a representative from the Gun Lobby enlists her employer, chaired by Sam Waterston's George Dupont, to support their cause and kill a gun registration bill. Sloane, for untold reasons, will not support such action and is instead enlisted by the head of the firm that supports the bill (Mark Strong) to lead their uphill battle in winning. Filling out her team are singularly defined members played by appealing faces such as Douglas Smith and Al Mukadam who make one note characters likable while Gugu Mbatha-Raw becomes something of Sloane's teacher's pet within this new crop of assistants showing both a strength and vulnerability in her characters complicated and emotionally hilly arc. John Lithgow is also a notable presence as is Jake Lacey (The Office) who turns a character only present to withdraw small excerpts of backstory from Sloane into a flesh and blood character. Directed by John Madden (Shakespeare in Love) Miss Sloane may come off as something of an extended episode of what one could find on cable TV on any given night, but given we're in the "Golden Age of Television" that might not be as big of an insult as it once was. And while Miss Sloane is the perfect type of feature to spurn a TV series of its own Perera does well to deliver a contained narrative with only hints of extraneous material informing the main storyline. Perera never allows such influencing factors to infiltrate the actual film and distract from the mission at hand though. It is easy to see how this might have been tempting given the history of Chastain's titular character and her reasoning for acting the way she does is brought into question a handful of times though never explicitly addressed. This brings around the idea of just how effective Chastain is in her performance given what she has to work with in Sloane is more or less a blank slate that is quickly filled with assumptions the moment she opens her mouth in that first frame. Chastain demands our attention be on her every time she enters a room-she has cultivated a reputation of serious influence and that is apparent in how we see her peers respond not just to her words, but to her presence. When she does inevitably speak these responses are even more telling; it is in the way Chastain lends Sloane an effortless fist of control over her linguistics that is absolutely terrifying and thrilling all at the same time. The character is a master manipulator-willing to go to any length to show she's willing to go to any length-Sloane is a pro at straight shooting and positioning the idea of staying two steps ahead of your enemy is not enough always remaining three steps ahead of whoever might dare cross or challenge her. It is the juiciest of juicy roles an actor could ask for and Chastain seems to realize this as it almost feels like she is gripping the camera every time she speaks; not letting loose until she catches her first breath. As the film hints at the past that might have brought such a character into being it compliments this lack of shading by displaying moments of vulnerability-though only two or so times total. Such vulnerability is necessary when one of the big mysteries around a character is how they get to the point in which Sloane has reached-an insomniac workaholic who pops pills to keep her energy up-but neither Madden, Perera, nor Chastain are willing to allow Sloane to completely give herself over to any one individual. Instead, they keep her convictions and humanity in line not by appealing to our pathos, but rather the ethos of the subject Miss Sloane is keen to bring attention to. Miss Sloane watches on as Esme Manucharian (Gugu Mbatha-Raw) makes a statement to the press. That subject of course, is gun control. The key word there being "control" as in making it difficult for dangerous people to get a hold of dangerous things and not simply taking things away from those who qualify. The film hits the nail on the head over and over again in saying that the supported gun bill is not born out of a desire to confiscate all guns, but rather the desire to keep such weapons out of the hands of as many psychopaths and criminals as possible. Perera phrases it in a handful of different ways so as to make sure those who possess guns legally don't view the film as an attack on their second amendment rights, but rather as a logical way to keep people safer. In illustrating why certain characters are motivated to feel the way they do Miss Sloane gives credence to either side of the argument and that both sides have valid reasons to act in the way they see fit. It is appreciated that small, but true facets of the battle being fought are brought up and debated rather than the films characters simply resorting to soundbites that form easily misconstrued generalities. The film as a whole embraces these small details and intricacies addressing the issue at its heart with a maturity and common sense that is too often lacking when topics are taboo to the point of nervousness when discussed in public. 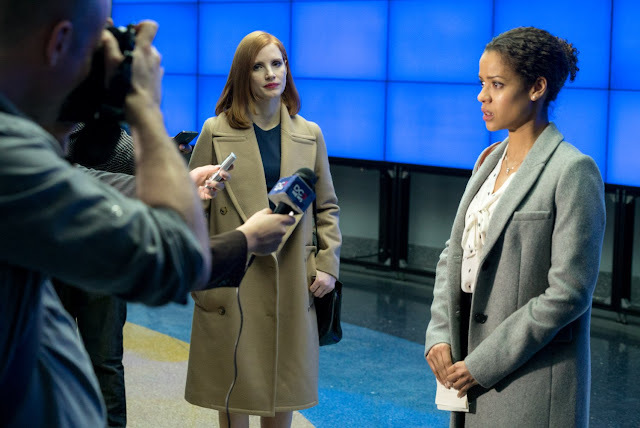 That said and as admirable as Miss Sloane tends to be for a vast majority of its running time it does inevitably falter when it begins to take turns that feel more outlandish than the first two acts hint at or prepare us for. Considering the blistering pace with which the film barrels through those first two acts it feels a bit deflating when, in the last half hour, Miss Sloane loses a bit of steam. The back and forth is consistently engaging and the debate and particular points characters make are naturally intriguing, but that back and forth goes on for just a tad too long. Overstaying its welcome to the point it seems the film itself doesn't exactly know how to wrap up all facets of the plot it has laid out thus forcing it to come up with some rather fantastical plot devices in order to give our protagonist the edge when much of what we've seen prior only needed determination and a brass tacks mentality. That said, Miss Sloane has her heart in the right place and her head on sturdy shoulders-never attempting to necessarily provoke or condescend, but more to expose the idea our system doesn't have to reward the rats and con artists of the game, but those who genuinely vote with their conscience. That may be a fantasy of sorts, but Miss Sloane lends a specific type of optimism and hope that we need now more than ever.